Ancient mythology has always had a fascination with Hybrids. In ancient mythology, there were imaginary creatures made up of body parts from many different animals. The following picture is a good example of a hybrid. 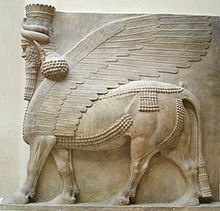 It shows you an Assyrian Shadu with the body of a bull, a set of wings and a human head. It was believed that the combination of all of these different parts created a being with special powers. If we transfer the same definition to the treatment of heart disease, a hybrid cardiac procedure is a combination of open heart surgery techniques and catheter-based intervention such as coronary angioplasties and stents to create a minimally invasive coronary bypass solution for our patients. When the report says you have triple vessel disease, that means that all three main vessels (LAD, CX and RCA) or their branches have a more or less severe blockages. If it says left main disease it means the LCA has a blockage before it splits into LAD and CX. This is a serious problem, often nicknamed “the Widow Maker”, that demands immediate attention by a heart surgeon. Think about it in plumbing terms: the more upstream the blockage is, the larger the amount of heart muscle in danger. If you close the water main supply in your basement there will be no water anywhere in the house. Many patients with single, double, triple vessel disease and left main disease require life saving coronary bypass surgery and can often be excellent candidates for a minimally invasive hybrid therapy of their disease. Initially bypass surgery was the only way to restore a good blood supply to blocked coronary blood vessels. Later on angioplasty techniques were devised and introduced in the therapy of coronary artery disease. 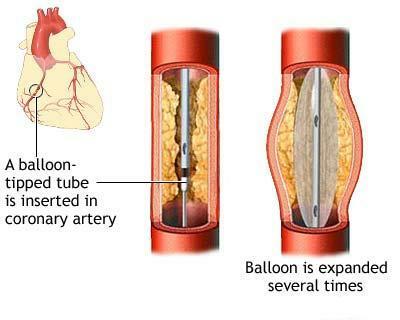 A thin catheter with an inflatable balloon on its tip is inserted across the blockage area and the blockage is then stretched open by inflating the balloon. That was a great idea but it came with a significant problem. The stretched blockage would often get narrow again soon after the angioplasty (an event known as Restenosis) and the patients would come back with the same chest pain or, even worse, with a new heart attack. Something needed to be done to prevent restenosis. Most innovators in our field have a very “mechanical” mind. The next crafty idea consisted in designing an expandable wire mesh tube that could be deployed across the blockage area to act as a scaffolding to keep it open and prevent restenosis. Now that you know a little more about this type of coronary intervention I can show you how minimally invasive heart surgery techniques can be married to stents in many different situations to truly achieve the best of both worlds. The planned combination of these minimally invasive procedures delivers a complete cure of many heart conditions in a low-impact, minimally invasive way with a fast recovery, tiny incisions, less pain and superior cosmetic results. I will give several clinical scenarios drawn from my clinical practice to help you see how a minimally invasive hybrid heart procedure can make a fantastic difference. A YOUNG WOMAN with severe coronary artery disease affecting the three main vessels is referred to my surgical service for a Coronary Artery Bypass which would normally require a 12″ to 14″ midline incision and splitting of the breast bone. She inquired about my minimally Invasive Techniques and we discussed at length what her best options were. She obviously wanted a complete cure of her disease but could not come to terms with the prospect of a huge surgical scar in the middle of her chest. I then arranged a hybrid approach that would address her specific coronary anatomy and allow an all-around minimally invasive approach. First, I had her right and circumflex coronary arteries opened up with angioplasty and stents. She was able to go home in less than 24 hours and I don’t need to tell you how ecstatic she was about having a surgical scar completely hidden underneath her left breast. I then performed a minimally invasive aortic valve replacement through a minithoracotomy the following day. The end result in both cases can be rightfully described as The Best of Both Worlds. Both patients had a successful treatment of all their coronary blockages and/or valve disease by using a combination of techniques that gave them a quick uneventful recovery, no need for any blood transfusions and excellent cosmetic results. Just like the imaginary Hybrid creatures of the ancient times, minimally invasive hybrid techniques combine different parts that come together to create a being with special powers.